What to do when you are on the move and need to quickly make a few changes in a PDF? Yes, having a good PDF Editing app on your iPad is a must, especially if you have the iPad Pro with Apple Pencil. In our previous articles, we saw some of the best PDF editing apps for desktop and it’s time for iOS now. 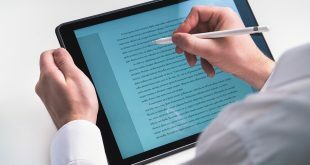 Let’s take a look at some of the best PDF editors for iPhone and iPad and see how they can help us stay more productive, get more work done, edit or even create PDF files while on the move. The menu is unrefined and looks a bit crowded. The app is really good at filling forms and annotating text. In fact, annotation comes with a number of tools like voice support, fonts, colors, highlight, markup, shapes, handwriting, and so on. You can add, reorder, remove pages but can’t edit text directly. 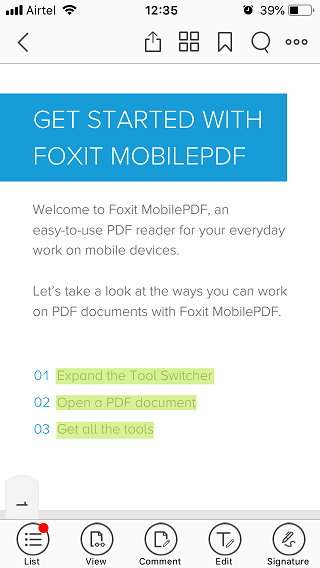 Foxit Mobile PDF is one of the best PDF editors for iPhone or iPad. You can not only view and edit PDF files but also Word, Excel, and PowerPoint files which is a bonus. Another feature is the ability to integrate with Evernote, the popular note-taking app. With Foxit Mobile PDF, you can sign documents in bulk. Useful if you own a company with many employees. You can edit documents, sign them, and share them with peers. Foxit Mobile also supports real-time group editing so multiple employees can work on the same doc. This is achieved via ConnectedPDF, a proprietary technology developed in-house. iPads have a larger screen and to take full benefit of the available screen estate, Foxit allows a tab view where you can open and edit multiple PDF files at once. 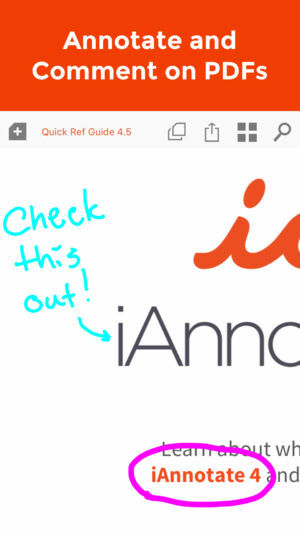 If you like to annotate a lot, both for personal and professional reasons, iAnnotate4 is for you. The uber PDF editor app for iOS offers a range of annotating tools with multiple options for fonts, colors, shapes, lines, stamps, notes, and more. Whether you are a student who wants to take notes or tech guy with a manual, iAnnotate has got you covered. There is support for Apple Pencil so you can use it to draw, sign or annotate. You can also record voice and add it as a note. What I like is the ability to customize the toolbar. See, there are a lot of tools at your disposal but you won’t be using all of them. You can edit to remove tools that you don’t want making your toolbar more compact and easy to search. iPad owners can open multiple PDFs and work on them in a tab view. Not only can you save PDFs in cloud storage sites like Dropbox, but also search them from within the app. iPad users will be happy to know that accidental touches resulting from wrists resting on the screen are not accepted. Smart. Great app for annotating. Readdle is known in the PDF world to make some of the most beautiful and functional apps and PDF Expert is no exception. 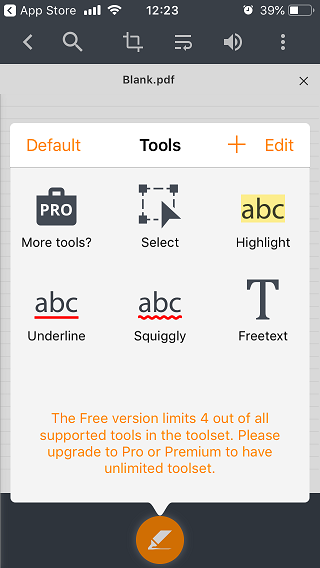 Though the number of tools to annotate is not as many as in iAnnotate, it is still a lot compared to most iPhone and iPad PDF editors in the list. Usual activities like filling forms, signing docs, creating and editing text or images can be done easily. You can quickly switch back and forth between thumbnail and full-screen mode to add, edit or remove pages. 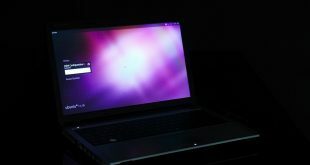 Popular cloud storage sites are accessible from the sidebar. While you can fill forms and sign documents, the latter can be a bit of a challenge for new users. 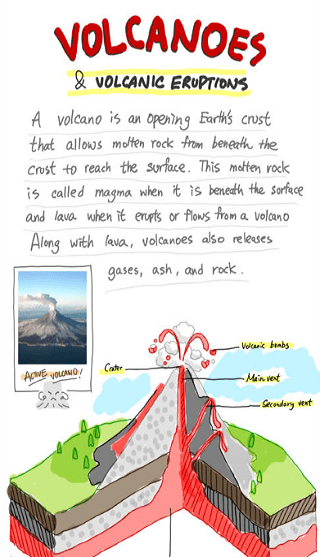 Drawing or annotating PDF files work with Apple Pencil or you can also use your fingers. Work in a corporate environment. You can redact lines easily. The good thing about PDFelement is that it comes with a one-time fee but it is priced rather high at $99 compared with other PDF editors. Let’s see why. Apart from the usual ability to create, edit, fill and sign PDF forms, there is the familiar OCR feature that lets you create PDFs from scanned images. Useful for certain industries and sectors. You can sign forms in batches or bulk. PDF Element comes very close to Adobe, just like Foxit does, but offers a better UI and seamless experience. Xodo is a free PDF editor that will take you by surprise. It is also the default PDF editor that I use on my Android and iOS smartphones. Xodo has a neat and functional UI that works right out of box. 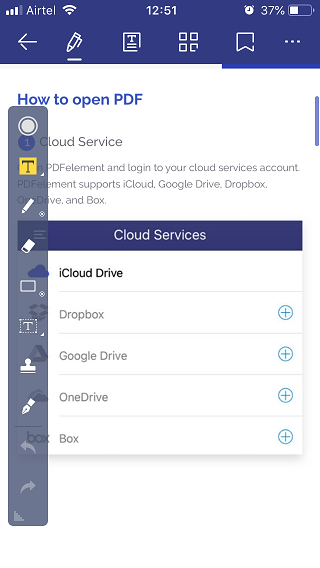 There is support for Apple Pencil and you can edit, fill forms, annotate, sign, and connect to cloud storage sites. This brings Xodo on par with most other PDF editors. 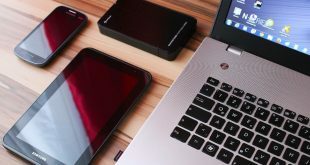 You can also collaborate with others using your favorite cloud storage sites so users can share and edit documents via email. Xodo also has their own cloud product if you are interested. There are no ads so how does it makes money. Xodo provides customized solutions for corporate clients allowing them to keep the app completely. Surprised to see this uber-popular PDF reader and editor at the bottom of the list? Here is the reasoning. One is that you probably already knew about it. Two because if you want to edit text inside PDFs, you can only do so on an iPad and not iPhone, even with the Pro plan. 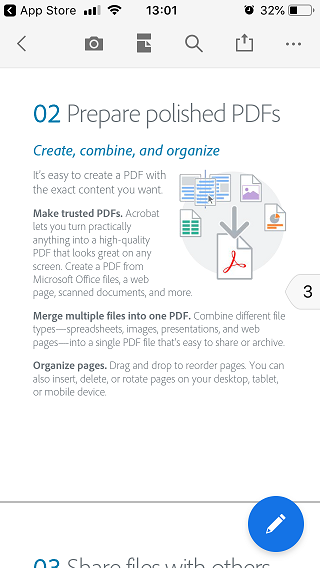 Adobe Acrobat Reader is free to use if you want to fill forms and sign them, rearrange pages, annotate, highlight, and share PDFs. Then comes the PDF Pack priced at $9.99 that will let you create PDFs, use OCR to turn images in to PDFs, and share the same. Then comes the subscription plan called DC Pro which is priced at $69.99/year which will let you edit PDFs but only on iPads and convert PDFs to and from other popular office formats. If you are someone who likes to or rather has to, take notes on PDF files on a regular basis, look no further. 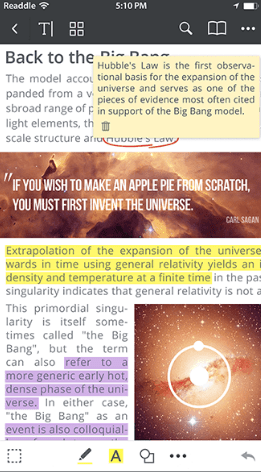 Just like iAnnotate is the best annotating app for PDFs, GoodNotes is the best note-taking app for PDFs. First thing is the powerful search that the app offers. You can search not only PDFs but also typed or handwritten notes inside PDF files. The search will work across all folders including folder names making truly global. The handwritten notes are created using vector ink which looks crisp. To make note-taking better, there are pre-built templates for different needs. Some examples are graphs, music sheets, lined papers, whiteboard and so on. 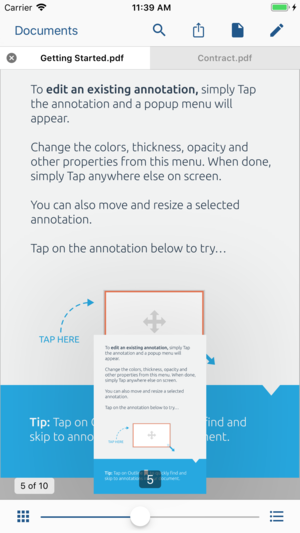 If you want an app to annotate then there is no better app than iAnnotate. Similarly, if you are taking a lot of notes inside PDFs, GoodNotes is the best PDF editor for iPhone or iPad. If you need a text editor then you should look at Xodo, Foxit or PDF Element. So, which PDF editing app are you using and why?